We can osbserve the original image rotated clockwise 90° of St. Ana's work. 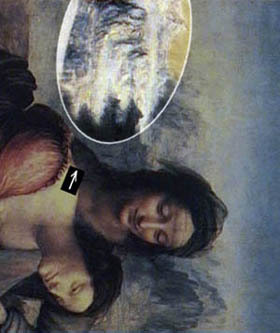 In the highest area is hidden Leonardo da Vinci's self-portrait. To observe it in the best way is needed to rotate subsequently the image anticlockwise 18°. 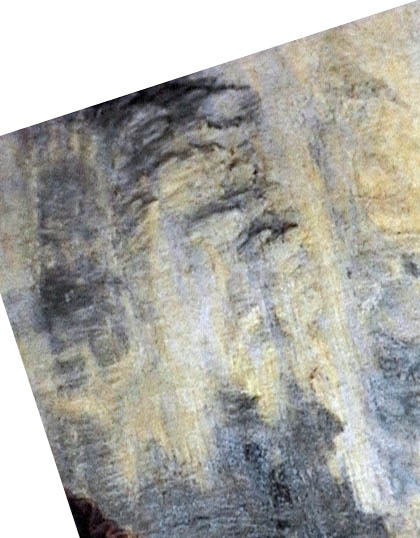 Leonardo's face seems almost to lean out traversely of the margin of the picture; it is not complete. "Leaning out" leaves the high part of the forehead outside of the same picture. I have defined the self-portrait in the internal part of the oval. To evidence it, I have used this time, the colors already presents in the original, that is to say, the white to the left, the black in the low part and the yellow to the right. The face's area, including the hair and the white beard, it is exactly equal to the original image. The face's base color is the same of the "battles compositions", rather, it is the continuation of the same "stain" of color. Some lines, beyond which the bottom color changes lightly, define without doubt, the new "unpublished one". The self-portrait shares some parts with that we have seen previously. The hair is the same of the "battles composition". 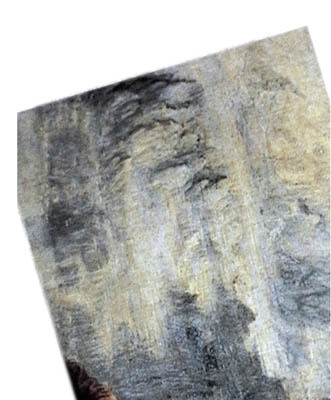 The composition's forehead becomes part of Leonardo's face. The features that before before formed the eye of the composition, become the self-portrait's mouth. To observe carefully, it is necessary to forget the portrait already seen, because otherwise, it is easy to distract observing it. The face presents always the same characteristic of all portraits discovered. It is important to point, his right eye well done, half-closed, while the other one is hardly visible. 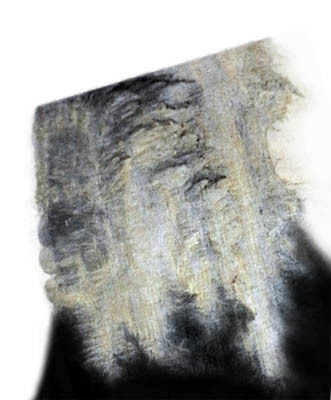 The image to the left is the "original" area of the self-portrait nearer. The image to the right, is the same, near, with the self-portrait only defined for the white to the sides, and the black in the lower part. Can be noticed the likeness of the somatic features, between this and Leonardo da Vinci's well-known self-portrait. This is an older Leonardo (St. Anne's work is considered unfinished, the artist died before be able to finish it). Always has the long beard, now completely white, shorter hair, and more suffering expression. In the upper image, to the left, can be noted the enlarged self-portrait's half-closed eye, compared with St. Anne's eye (of the same picture), to note the artist's usual "style". Can be noted in the new portrait's eye the particular details of the lashes, the brows, the design features that form the lid, and those that form the high shade of the nose.